SSDs, the newest kid on the block, is trying to dethrone the big old HDD that’s been around for decades. 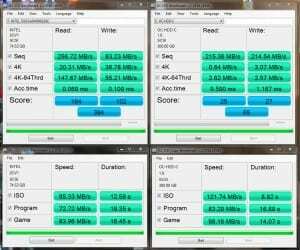 I’m sure many people have seen or read an article on the new SSDs and have seen benchmarks of how fast they are. I’ve been thinking about them a lot over the past 3-4 months, asked many questions, did research and finally came to the conclusion to pull the trigger. Shows some nice numbers actually and can show that SSDs do have their advantages, but as well so do HDDs at least in the case of Intel’s and large writes– sequentially that is. I tossed the following two runs in here just because everyone else seems to use this benchmark even though it’s more aimed at HDDs then SSDs. So to give the HDD a little more edge figured I would run it just to see it. Once again, not bad. 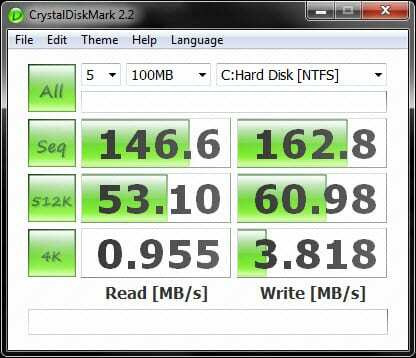 No shock that 2 SSDs in Raid0 really can take out the HDD’s knees. So I installed Win7 RC on the drive and some critical drivers and programs pretty quickly after I got up and running. The whole entire process might have taken me roughly one hour. This is from booting to install Windows, to full reboot, updates to the OS, and install of programs to a usable desktop once again. Win7 install only took approximately 10minutes when installing Win7 off a 4Gig memory stick. I don’t remember how long it took me to install from DVD to my Raided HDD’s but it definitely wasn’t this quick. One program in particular, Inventor Studio 2010, would take anywhere from 25-30minutes, installed in under five. I spent more time trying to find what to install next then I was probably installing programs in total. Here is where speed is a key. Say take 1,000 4kb files and you want to read or write them just taking access speed into consideration. Zero overhead has been taken into account with this. 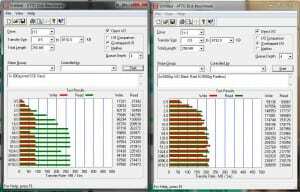 We’ll use the access speed on reads from the images above section “The First Benchmarks”. The test would have included a single 640Gig HDD in the test, but I don’t have any clean enough to give good results at the front quarter of the drive, only back quarter. This will seem really unfair, so I omitted testing on those. Look at that difference. 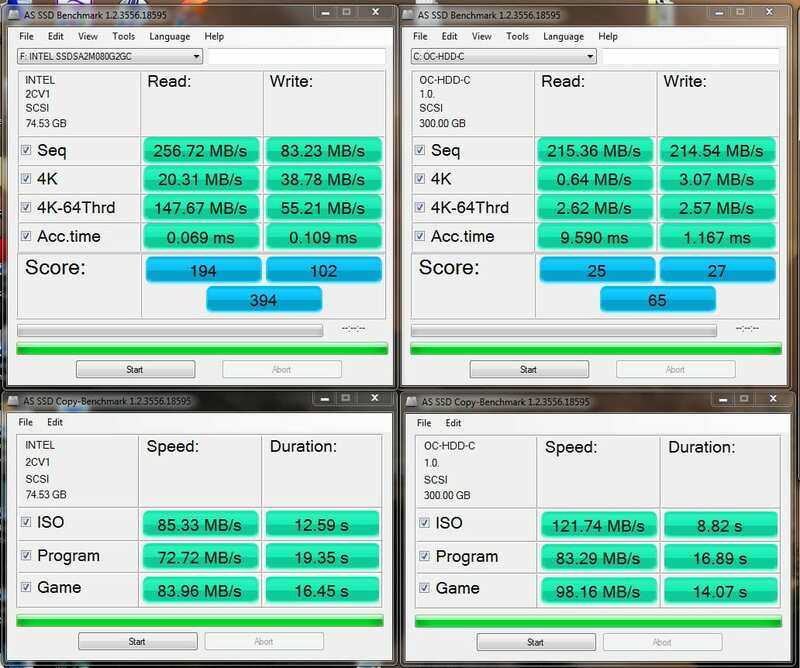 Take the break down on the writes, SSD raided or not is nearly identical. Now looking at the HDD you’re looking at 10.7-11.2x longer to “write” the files theoretically. The reads are even more outstanding, and since this is what you typically use in day to day, really it’s the more critical number especially dealing with smaller file sizes. Looking here at a whopping 133.2-138.9x longer for the HDD to react! The reads on the HDD are horrible considering, and about the biggest time saver period saving… nearly 9.5seconds off the time to just read those files. 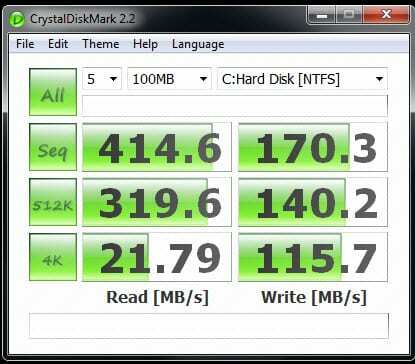 Larger writes depending on the SSD can even beat 2x HDDs in Raid0. Intels’ run a little lower in this department but more than make up for it in the smaller file size writes, which can be 3-4x faster than the competition. But even then, SSDs could have low write speeds on the drive but makes up for it not only in access time, but constant speed across the whole disk itself. Traditional HDDs start fast and loose steam out at the back half of the drive taking sometimes up to 50% off their reads/writes and access times. Hard drives are a reliable machine. It has been around for years. It has proven itself time and time again. Its… well you get the point. Manufactures give typically a three to five year warranty on the retail products of the HDDs. If the drive is going to have an issue, it will typically die in its infancy. After the initial period in its life, death rates will shoot up at around three to four years of use. Not bad, usually by that time there are bigger/better HDDs out there and with how much data goes around these days it could be filled by that time. 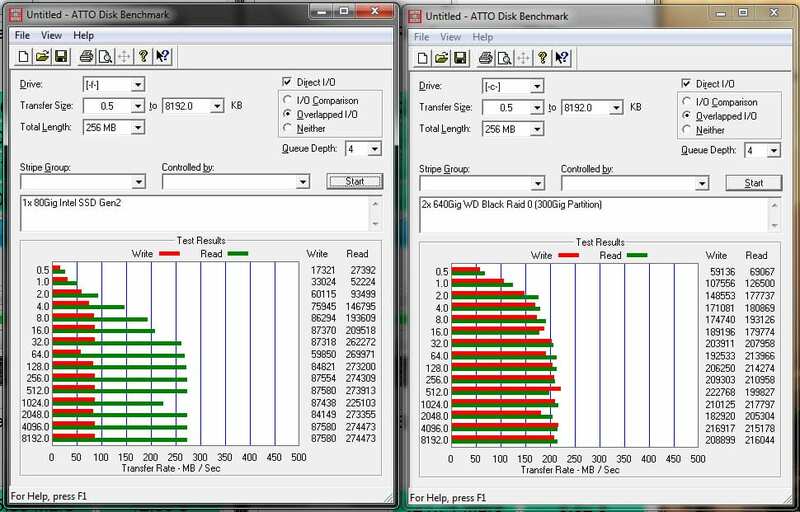 If you move around a lot, the technology in HDDs have gotten better at being shock resistant by parking the heads when shut down. Though moving the HDD while it’s running, even if it is a little, is not the best idea in the world. Temperature differences can also have a big effect on these drives which is why they are not really used in extreme conditions. Now SSDs, they have zero moving parts, new tech, fast, and has a huge potential for growth in the future. Life of the actual drive itself, well manufactures rate it better than traditional HDDs for run times at least. 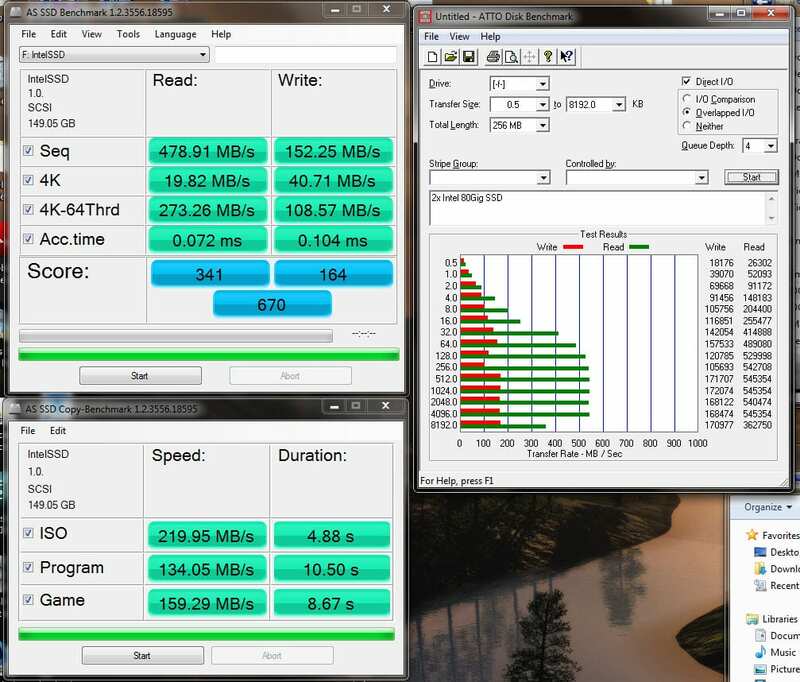 Since the drives are still relatively new in the computer world compared to the standard mechanical drive it might take time really to get reliability data of the drive, but unlike our mechanical guys, SSDs have a limited life. MLCs have a range of 10,000+ writes per cell, and SLCs have 100,000+ writes per cell. Of course I’m sure there is some range that is acceptable around that figure, but really we’ll just focus on MLC drives because it’s a drive that if people can afford to currently will probably buy. First time people hear about SSDs and their limited amount of writes they put the brakes on full stop. I know I did in the past till I looked at the numbers. MLC has about 10,000 writes. Now you have a drive that is 80Gigs in size (about 74.5Gigs usable). First off really there is 80Gigs usable but the controller uses that extra space that typically is used up on mechanical hard drives for space to replace bad cells over time. Now that we have that, just imagine the drive is 80Gigs overall. If lets say you install the OS, a few games and programs and decide you don’t need one and delete it. That is cool and all, and unlike a traditional drive it will actually delete it and it will be un-recoverable, so be careful now or use that recycling bin a little more. Writes and deletes on a SSD are special, as mentioned above but there is more to them than that. To help take load off the onboard controller the drive is separated into 512kb Blocks, and in each 512kb block there is say 128 4kb smaller blocks. While you can write say 128kb to the block and come back and fill the rest of the block up with data that’s no problem. Except when you try deleting that 128kb file, it has to cache the whole 512kb Block, delete the file in memory and re-write the remaining files (in a new location) on the drive. Reason why this is is because the drive doesn’t keep track of files; that could put too much strain on the controller itself, so it just keeps an eye on how many cells are occupied. This is where wear leveling comes into play. It will write to only cells that haven’t been used or have the least writes on it before writing on an older cell. This will help keep the drive intact much longer; otherwise you could prematurely wear out certain spots on the drive really quickly while the rest is unblemished. Now that you have an understanding of how it works, move onto what people should really know about the drive. The theoretical true life of the drive if looking at 80GB drive is 80TB worth of data to be written to it. So let say you have 40GB of data on the drive that does not change, no deletes, just constant data on the drive and only have the 40GB of space. Now on an average day, weather you’re gaming doing work, or just surfing the web how much data do you really think you’re writing to your hard drive? Probably depending on how much you use it. Two and a half to five GB would be on the high-end average per day including software installs on the PC. Still that might be an excessive number but we’ll run with five GB per day, which is written and deleted (just to make sure we have constant 40GB free). So with wear leveling of the drive it will take eight days before it will re-write on top of that first cell of the drive. So eight days and you just ate one cycle of that 10,000. Multiply that over and that’s 80,000 Days or 219 Years. Now you say you use more than that, how about 20GB per day? Two days to fill up the cells, 20,000 days or ~58 years. As you can see unless you’re doing some hefty writes on this drive it will last well past what it’s worth. Even if you go to the extreme of saying that 40Gigs writing to constantly at a max of 75MB/sec. 4.5GB/min or 270GB/hour would last a whopping ~6.2 Days at that rate. Idealistically though, if you have 40TB of data writing to the drive you’ll have a lot more storage and some insane amount of data going through the system that is not of a home user. At the end of the day if you’re still fighting on deciding to jump onto the SSD ship, why wait? Price can be a big factor right now but even a small 60GB drive will do you nicely for an OS drive. The system feels faster, much faster than most CPU upgrades on the PC, since the mechanical hard drive is really the main bottlenecks in systems these days. Worried the drive is going to die because of the write limit? Well if you’re writing huge amounts of data to the disk, SLC would be your next option giving you 10x more write cycles, just at a cost. As well if you think you need a lot of storage space; considering I’m running Win7 RC right now and you can disable a lot of items that will reclaim a huge portion of your HDD space. I’m running ~35GB of data on the drive and got the key programs installed, roughly 3GB of games and some rather large apps, think another 10GB and I’ll have everything I had from my last system on the drive, which jumped between 80-100GB worth of data (system recoveries helped that). My investment into my 2x SSD have been one of the best purchases I’ve made for my system in a long time and I’m happy about it. I’ll recommend that anyone who can do it, to do it. They own them... and I don't even have one. It's the same thing in the iPhone... iPod, etc... they've been around for years. Yeah ment it mainly for OS/App related programs. Personally I really only use my SSD's in my main rig. Everything else is on a server and on Mech Drives. It acts like a whole new system with a good SSD. 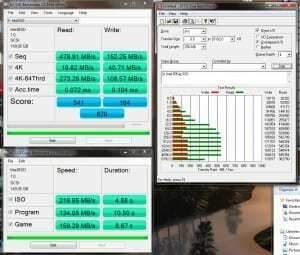 Case in point recently P4 D640 (3.2Ghz /w HT) replaced a failed 160Gig HDD with a 80Gig SSD. Difference... night and day. Loaded Win7 on it, ran smooth... even for such an old CPU it ran quiet well doing basic things (web, e-mail, word, etc). Get a 120g SSD put your OS, Games, and a few apps on it. Than get a min of 2 drives and RAID them together (get 4 so you can use a RAID 5) and than use that for storage of your files. On top of that I use a 200g laptop drive to make an image of my SSD every few weeks just incase it fails. On top of that I use a 200g laptop drive to make an image of my SSD every very weeks just incase it fails.